My birthday was this week. 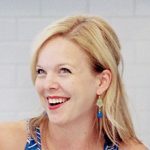 If you have been reading my blog a long time (or at least, since my last birthday) then you may remember that I like to make my own birthday cake. For me, it’s an opportunity to make something new and fun, and spend some time playing in the kitchen. You also may remember that for me, choosing what cake to make is an agonizing decision. It doesn’t need to be, but I always make it into a big deal and I simply cannot make the choice myself. This year I wrote down a list of all my potential cakes, numbered them, and asked Ben to choose a number. 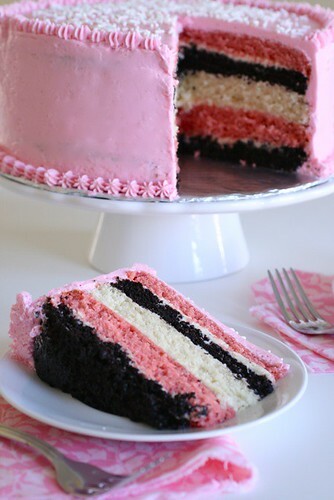 And so I present to you this year’s winner, neapolitan layer cake. As it turns out, this was a wonderful cake choice. Every year growing up our nanny would bake each of us the birthday cake of our choice. It was always simple, from a box with canned frosting, but it was what I was used to and I loved it. 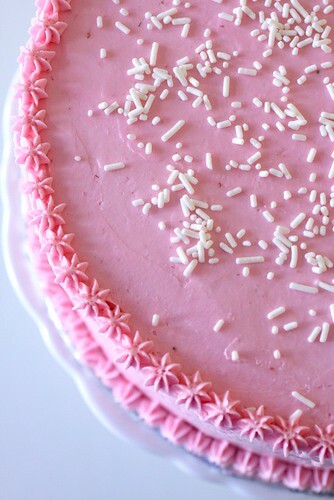 My choice for as long as I can remember was strawberry cake with vanilla frosting, and it was delicious. When it turned out that this cake was the winner of Ben’s random decision, I was happy because it is basically a much more involved version of that basic strawberry cake. Baked goods such as this with several components are my favorite kind to make. I love the complexity, and the ability to work on one part at a time, as I have time, and then see the whole thing come together into one awesome cake. 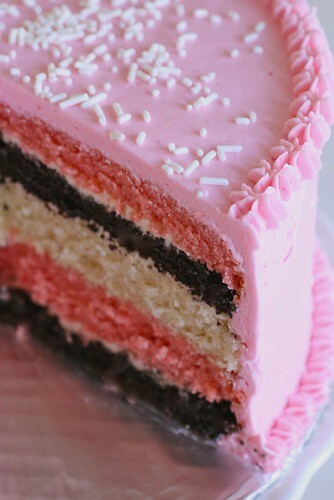 This includes layers of chocolate, vanilla and strawberry cake, as well as strawberry Swiss meringue buttercream frosting. Three separate cake layers are baked and then torted to create six thin halves. I only used one of the vanilla halves here. If you decide to go that route, you might consider halving the amount of vanilla batter and then avoid ending up with an extra layer of cake – that’s probably what I will do next time. This time I used a thin smear of vanilla buttercream between the cake layers to help them stick together, but next time I think I will use strawberry jam as was done in the original recipe. That is mainly for appearances, as I felt the layer of frosting between the cake layers made the inside a little less visually impressive. I really wanted to accent the top of the cake with chocolate and strawberry Whoppers, but my store didn’t have the strawberry kind in stock and I didn’t feel like making an extra trip just for that. But I think it would look super cute! This was very well received by the friends that came over for my birthday dinner. 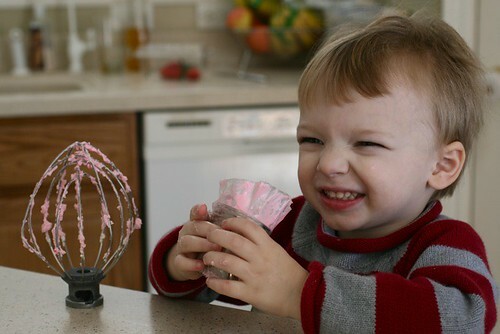 It’s a fun, whimsical cake that made me feel more like a kid and less like I’m getting closer and closer to 30 :) And as you can see, my little buddy enjoyed a little extra frosting during the decorating process. He loves to help me in the kitchen, particularly when there is frosting involved.